I'm amazed by the power of social networking. Just today I was searching the internet for a local Sunday Farmer's Market with no luck. I logged into FB and noted an old high school chum had posted a link to her friends' website with the notation that they would be selling their veg at a local farmer's market. This is how I found you Pitchfork and Crow. Cute website and lovely veg. 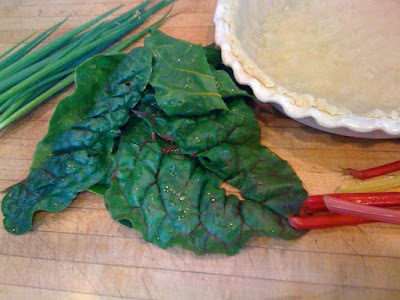 Their noted recipe for Swiss Chard Pie was my inspiration for dinner. Of course I tweaked it a bit. The recipe below only varies slightly from the original. I used a no roll pie crust recipe and adjusted the amounts to my liking for one pie. Heat oven to 400 degrees. Brown onion and garlic in butter. Trim and chop chard, add to pan, and cook until wilted. 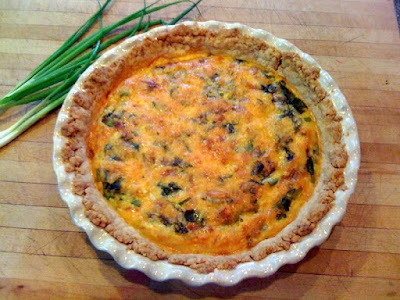 Beat eggs in a bowl; mix in cheese, salt, and chard mixture. Pour into pie crusts. Bake until knife inserted into center comes out clean, 30-40 minutes. Yah! I'm glad you found us and that you tried the pie too. I hope you liked it. Hoorah for Facebook and local vegetables!